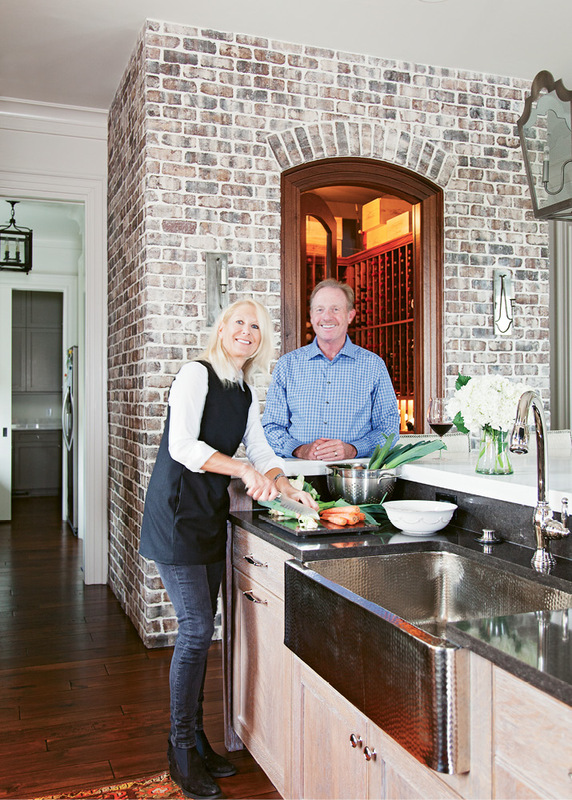 Kelly and David Lyle’s kitchen is the center point of their custom Shingle-style home designed by Herlong & Associates. in the mix: Accent walls of brick and butted board help to set a welcoming, laid-back tone, while gilt-framed artwork and fixtures from Circa and Urban Electric add touches of elegance. 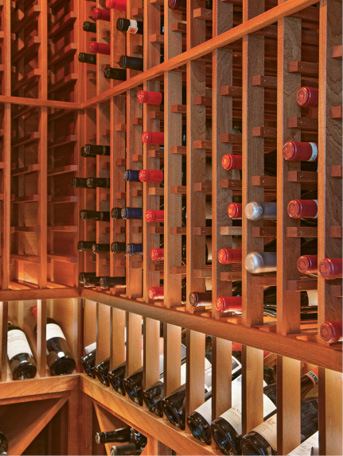 CROWN JEWEL: Tucked into the brick wall of the kitchen, the petite wine cellar holds 950 bottles. in harmony: The Lyles spotted these ottomans for the music room on a trip to the Atlanta Decorative Arts Center, then had them covered in an embroidered fabric by Zimmer + Rohde. 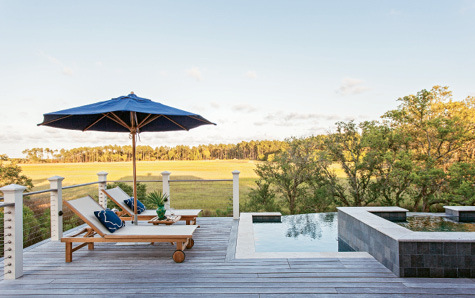 VIEWFINDER: Kingsley-Bate outdoor furnishings and a bluestone hot tub provide plenty of vantage points for taking in the backyard’s creek vistas. 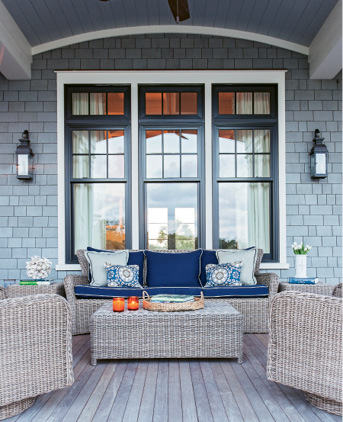 An inviting porch beckons at Kelly and David Lyle’s custom creekfront abode on Daniel Island. 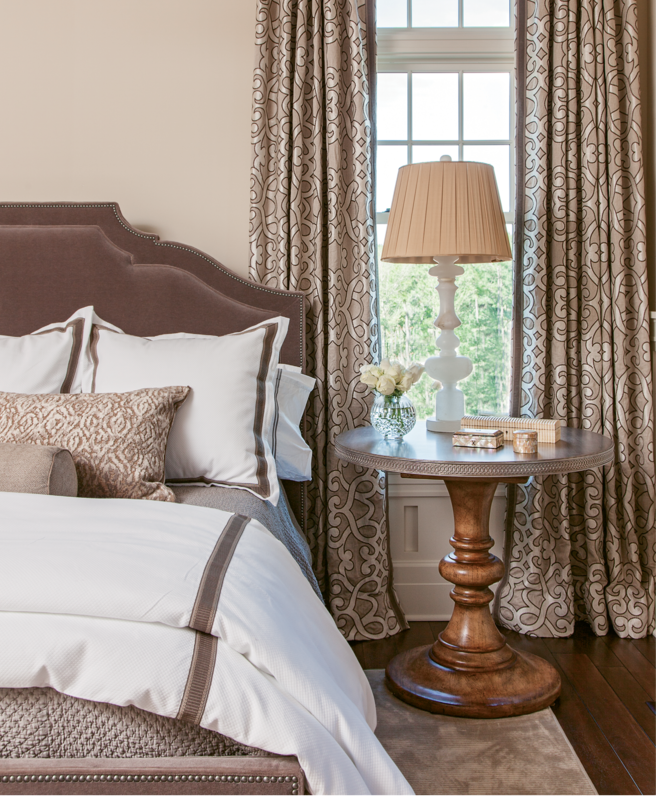 Check out the newlyweds’ laid-back yet luxurious style in The Charleston Home. When Kelly and David Lyle decided to tie the knot in 2013, there was no question as to where the newlyweds would make their home. The active retirees—he’s a former civil litigator; she’s the founder and former owner of 2 Oceans Promotions, a Charleston-based promotional products and services firm—are avid golfers and longtime residents of Daniel Island, and their courtship unfolded amidst the community’s pristine courses and waterfront vistas. “We love the island and its lifestyle,” Kelly notes. So they knew they’d reside here, in their beloved town nestled between the Cooper and Wando rivers. What was less clear was whose home would become headquarters for their married life. Ultimately, they decided to kick off this new chapter by selling their respective residences and building a shared one from scratch. 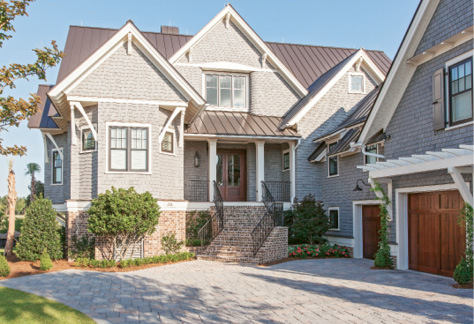 Pop by the resulting Shingle-style abode and you’re likely to find the two relaxing after a challenging day on the golf course. Much like its owners, the house is elegant but decidedly low-key and welcoming. 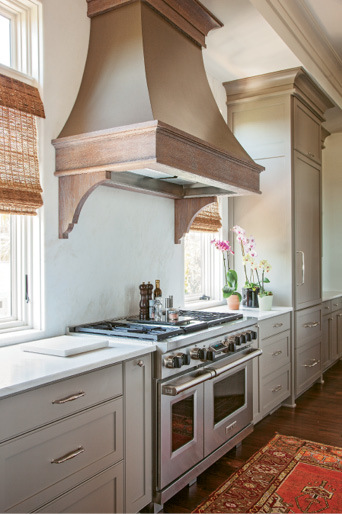 In the kitchen, twin sculptural chandeliers from Urban Electric illuminate a roomy wraparound island where guests are invited to take a load off and unwind. Looking tanned and trim in a golf skirt, Kelly settles into one of the island’s cushy high-backed stools while David ducks into the adjacent jewel box of a wine cellar to peruse his vast collection for a bottle to uncork. From there, the evening might draw them into the den to watch football, out onto the porch to enjoy a dip in the bluestone hot tub, and back into the kitchen for a meal of pan-fried crab cakes or salmon and veggies complemented by another glass of wine. “We like the simple things,” Kelly says—and the house certainly makes it easy to enjoy life’s little pleasures. 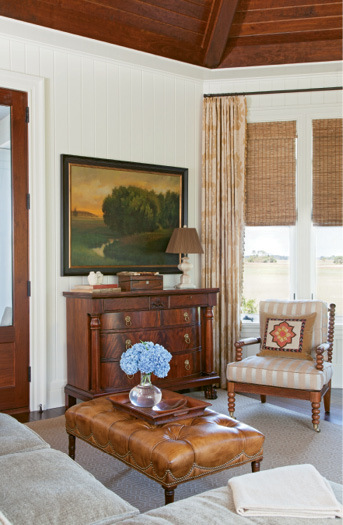 In fact, this afternoon represents just the sort of laid-back living the couple had in mind when they enlisted architecture firm Herlong & Associates, general contractor Phillip W. Smith, and interior designer Melissa Ervin to conjure their dream home. But first they had to hunt for a plot on which to build, ultimately falling for a tucked-away spot overlooking Ralston Creek on the north side of the island. “We love the ever-changing vistas on the marsh,” Kelly says. And while the lot is just a five-minute drive to the Daniel Island Club, it’s situated on a quiet cul-de-sac where plenty of undeveloped land offers unobstructed views. With the location secured, lead architect Bronwyn Lurkin drew up an open floor plan that pivots around the kitchen, which the Lyles say has become a natural gathering place. “Family and friends love to congregate here,” Kelly notes. 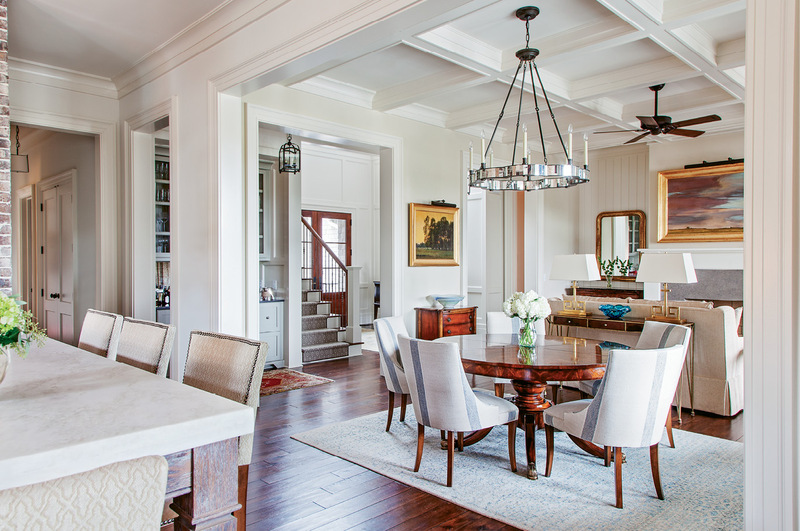 “It’s the perfect spot to hang, with the rest of the house unfolding in 360 degrees around you.” From her perch at the island, she gestures towards the dining area, music room, and back patio stretching out behind her; the den, with its dramatically vaulted ceilings and plush furnishings, beckons from the other direction. With the ground-level master suite just a few steps away, the couple spends much of their time on the first floor. “We love a ranch-style home, and we’re basically able to live as if this were a ranch,” David explains. But when visiting family members and friends come to stay, the second story accommodates them with guest quarters and a comfy den. “The house can expand to fit our needs,” he adds. 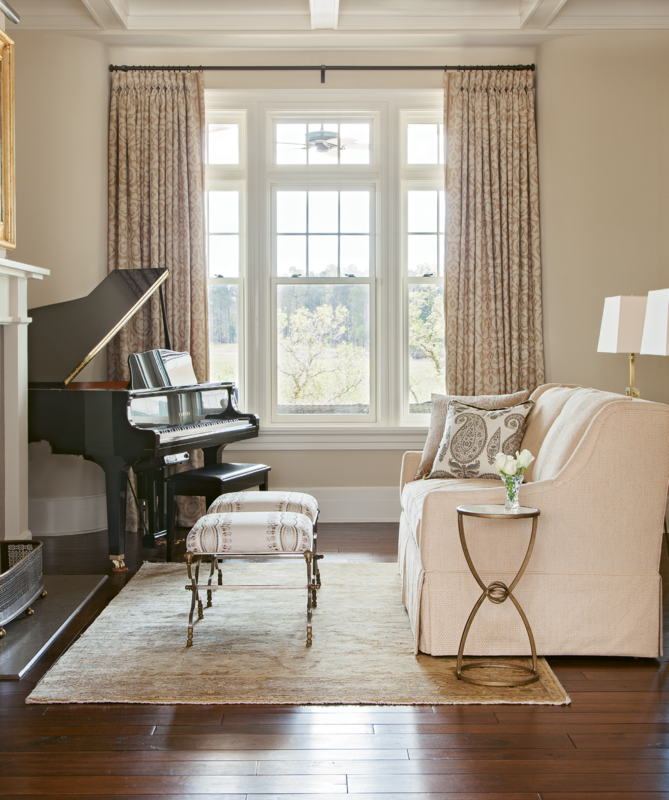 The groundwork thus laid, interior designer Ervin stepped in to help the couple cultivate a sense of casual elegance by guiding them toward finishes that feel luxe but unfussy. “We wanted the bones of the house to be neutral, but then we mixed things up with a lot of great materials,” she says. In the kitchen, a brick accent wall adds texture and warmth to balance the gleaming wood floors and marble counter-tops; in the living room, a butted board wall has a similar grounding effect, while the coffered ceiling draws the eye upwards, creating visual interest and subtle drama. And the décor dials things up a notch, too, thanks to posh light fixtures, such as the mirrored number over the dining table, and gilt-framed paintings by local artists such as Chris Groves and Jill Hooper. The petite wine cellar is also pretty posh. The Lyles are passionate about vino, and David recently teamed up with friend and fellow aficionado Andy Berly to launch a small-batch winery based in Mendoza, Argentina. The Lowcountry entrepreneurs christened their venture “Luna de Esperanza” in homage to the Palmetto State’s crescent moon. The climate-controlled cellar holds 950 bottles and provides a custom place for David to store his own blends, as well as the hundreds of bottles he’s collected from boutique wineries around the world. 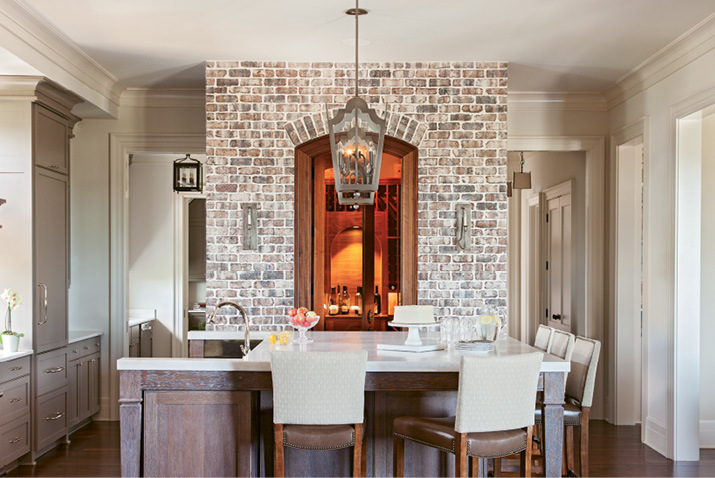 In this nook, wood tile, built-in wine racks, and custom task lighting provide both beauty and utility.